UW-Madison’s annual Entrepreneurial Achievement Awards Thursday were given to two alumni — Michele Boal and Troy Vosseller — for their entrepreneurial success and commitment to encouraging the next generation of entrepreneurs. They were honored Thursday, May 4, in a ceremony at the Discovery Building. The paths to success for many past winners of the Entrepreneurial Achievement Awards share common threads — long hours, creativity, dedication. The winners this year share an additional commonality: They both started down the entrepreneurial path selling T-shirts on campus. One continued down that path to State Street and the other headed west to Silicon Valley. Boal is the co-founder and chief philanthropy officer of Quotient Technology (formerly Coupons.com), a Mountain View, California, company she started with her husband in their basement in 1998 that has grown to 650 employees around the world. She also started Coupons for Change in 2011 to help end childhood hunger. Boal is a 1991 graduate of the UW–Madison School of Journalism and Mass Communication. She is a member of the Silicon Valley Social Venture Fund and remains active with the UW, serving on the College of Letters & Science Board of Visitors and speaking to students from around campus about her entrepreneurial experience. Vosseller is the co-founder and managing director of gener8tor Madison and Milwaukee, an accelerator for high-growth startups. Gener8tor has helped launched more than 30 companies and secured millions in venture capital for Wisconsin companies. He also co-founded Sconnie, an apparel company located on State Street that was launched out of his dorm room. Vosseller has deep ties to UW–Madison. After earning his B.A., MBA and J.D. from the UW, he was an assistant clinical professor/supervising attorney at the Law School’s Law and Entrepreneurship Clinic. 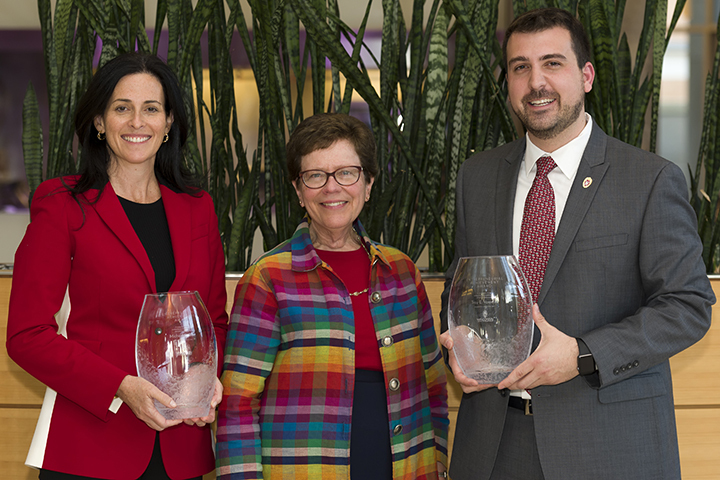 Chancellor Rebecca Blank presented the awards to Boal and Vosseller while saluting their efforts to encourage and support future entrepreneurs. “Each of these successful entrepreneurs is a tremendous asset to our university and the business community,” said Blank. “We are proud to call them Badgers, and thankful for their tireless support of our students and this university. The Entrepreneurial Achievement Awards are a product of UW–Madison’s efforts to create a campus culture that cultivates creativity and encourages innovation. The entrepreneurial major and the certificate program in the Wisconsin School of Business continue to grow each year. Past winners of the award include: Christopher Salm, founder of Salm Partners and the first chair of UW–Madison’s Meat Lab industry advisory committee; Andrew Ziegler, co-founder and managing partner of Artisan Partners LLC and owner of Erin Hills golf course; Pavan Nigam, a serial entrepreneur and angel investor who founded the company that’s now WebMD; Judy Faulkner, who founded Epic Systems in 1979; James Weinert, who endowed the Weinert Center for Entrepreneurship and created Weinert Applied Ventures in Entrepreneurship; Elisa All, founder and president of 30Second Mobile; Michael Shannon, founder and managing director of KSL Capital Partners; and Animal Sciences faculty member Mark E. Cook, who founded Aova Technologies and co-founded Isomark LLC.